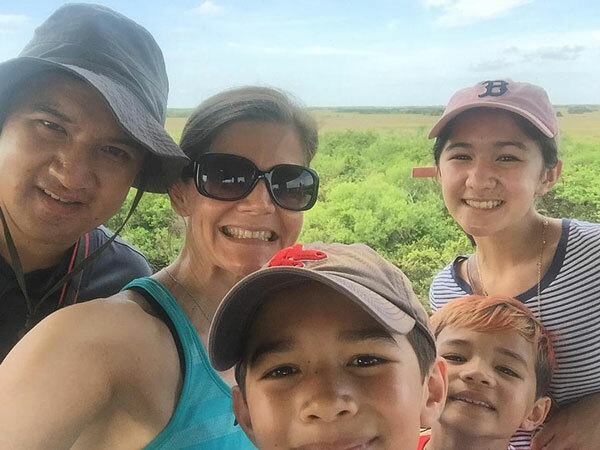 Out of all the National Parks that my family and I planned on visiting this week, the most ambitious (and one I most looked forward to visiting) was Everglades National Park. 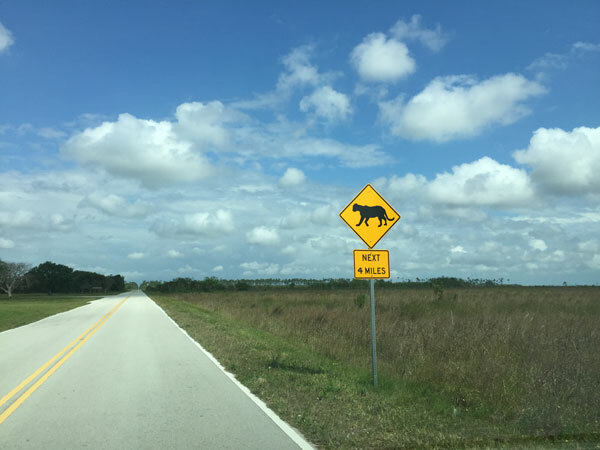 I say “ambitious” because Everglades National Park spans 1,508,538 acres and contains 4 separate Visitor Centers — each with their own distinct areas of interest. I say “most looking forward to visiting” because it is the one park I knew very little about. 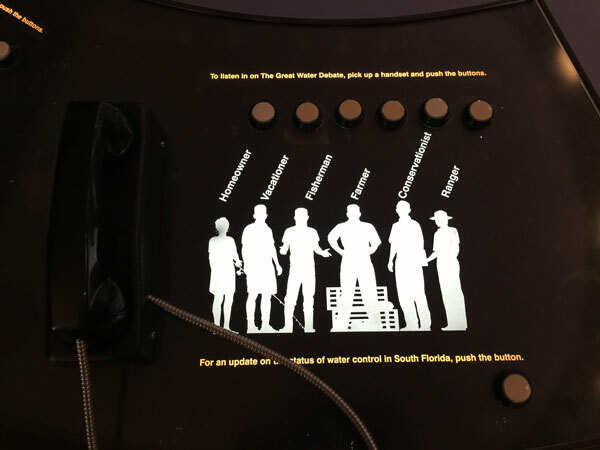 We spent 2 full days exploring Everglades National Park and managed to visit 3 out of the 4 Visitor Centers: Shark Valley at the North Entrance, Ernest Coe Visitor Center at the main East entrance, and the Flamingo Visitor Center located at the South of the main Florida portion of the park. The only visitor center we were unable to visit was the Gulf Coast Visitor Center which serves as the gateway for exploring the Ten Thousand Islands. Maybe that’s a visit for another trip! With 2 days of experiences it is impossible to cover it all. 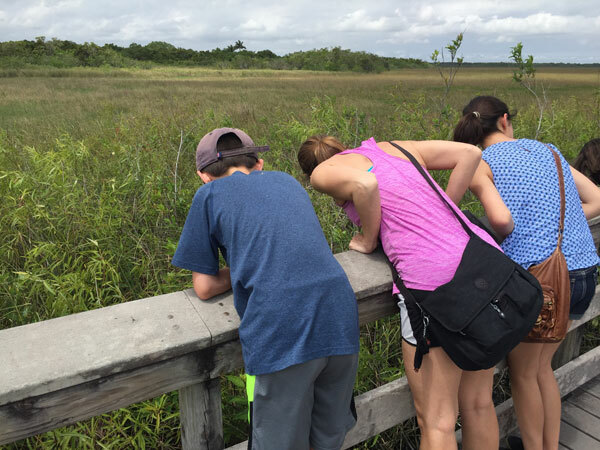 So here are the 5 most memorable things from our family’s trip to Everglades National Park. 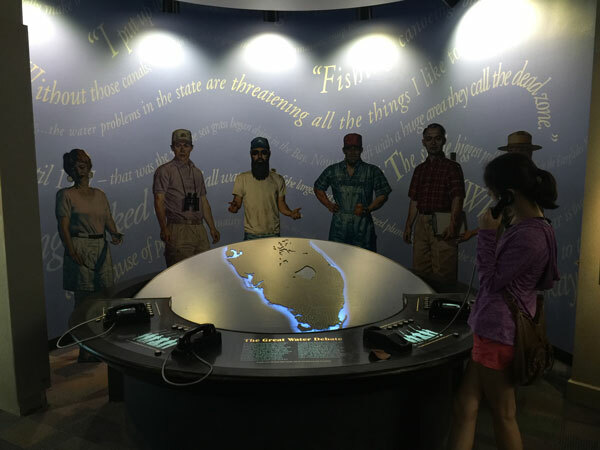 The Shark Valley Visitor Center features a 15 mile paved loop road with an observation tower at the midway point. 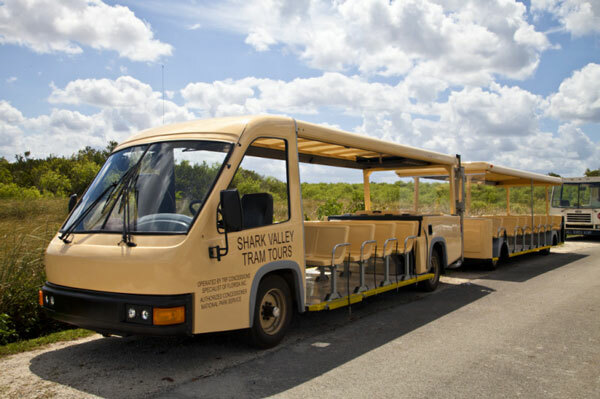 You can walk, rent bicycles, or take a tram tour from Shark Valley Tram Tours which is a vendor that is contracted by the National Park Service. We called ahead to reserve our tickets and I am so glad we did. Everyone says the first couple of tours in the morning are the best because you get to see a lot of wildlife and we were not disappointed. We saw tons of alligators and birds and better yet, we had a very informative tour guide that took us through the history of the park. The highlight for me was climbing up the observation tower. In the middle of the tour we got about 20 minutes to walk up the tower and see the amazing views from the top. 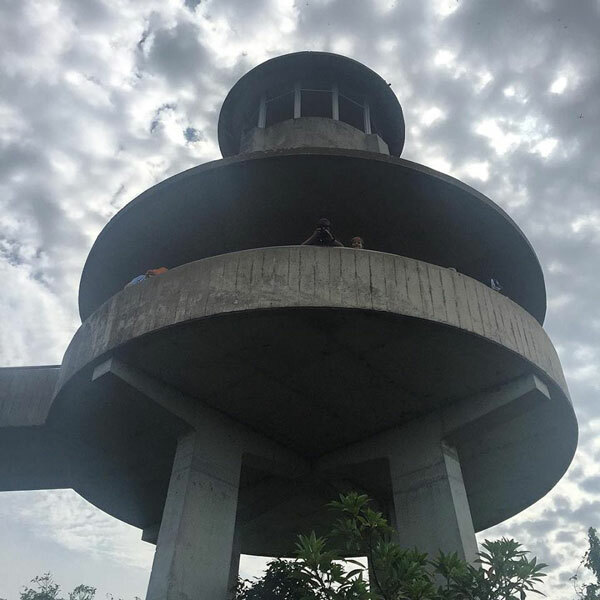 The shape and design of this observation tower seemed very familiar to us. It looked very similar to the observation tower at Clingman’s Dome at the Great Smoky Mountains National Park. Our tour guide confirmed that both towers were constructed in 1965 to mark the National Park service’s 50th birthday! As you know, 2016 is the 100th birthday of the National Park Service. I was excited not only because we had recognized the shape and design of the tower but also because we visited The Great Smokey Mountains National Park last year! We hiked up the tower and grabbed a 5 person selfie the best way our short arms could handle! – Leave time after the tram tour to walk some of the pathway at the end. There tends to have a lot of wildlife near there. 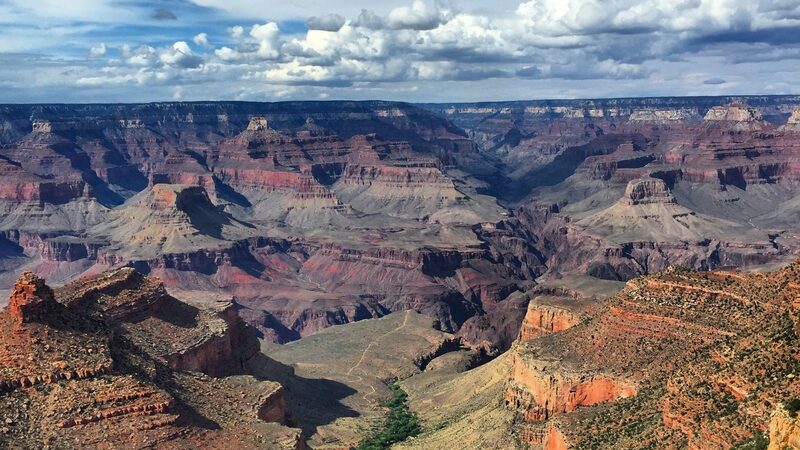 – National Park Passport Stamp is located in the Visitor Center. The main entrance to the park is on the eastern side near Homestead, Florida. 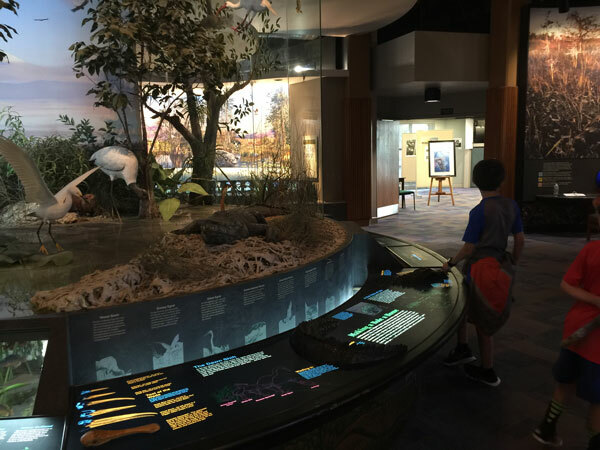 The visitor center is called the Ernest Coe Visitor Center named after the “Father of the Everglades” who envisioned the park. This main visitor center certainly did not disappoint! Interactive displays talk about the fragile ecosystem. In particular, I liked this bird watching exhibit. I also really enjoyed this display on the “Water Debate”. In it, you listen to many different perspectives on how the land and it its animal inhabitants should be treated. The kids seemed to find this one incredibly informative. – There are clean bathrooms, water fountains, and a bookshop. – The theatre shows an 18 minute film produced by the Discovery Channel. 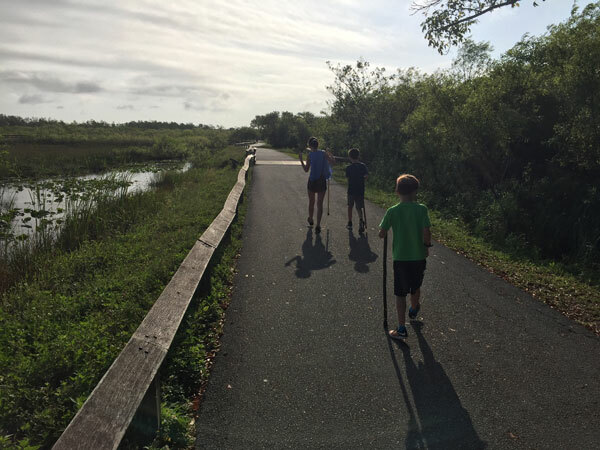 In all my research on how to spend time at Everglades National Park, the most common answer is Ahinga Trail at the Royal Palm Visitor Center. 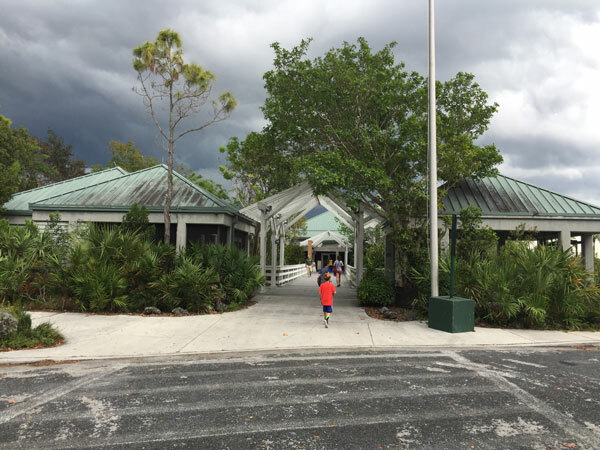 The Royal Palm Visitor Center is located about 4 miles from the Ernest Coe Visitor Center. It has bathrooms, water refill stations, and a small bookstore with some snack items (mostly candy, chips, and bottled water). 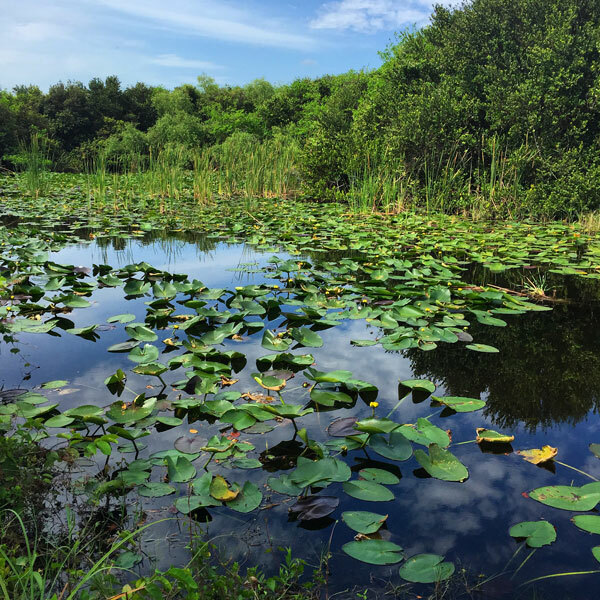 If you have just a few hours to spend at Everglades National Park, I recommend spending it here at Ahinga Trail. It is a leisurely, wheelchair accessible route that is less than 1 mile round trip. The reason this trail is so great is the high likelihood you will see wildlife. In a short time there we saw alligators, turtles, anhingas, herons, egrets, and many other birds. This is a perfect place to take wildlife photography and to have a nice glimpse of the wildlife within the park. 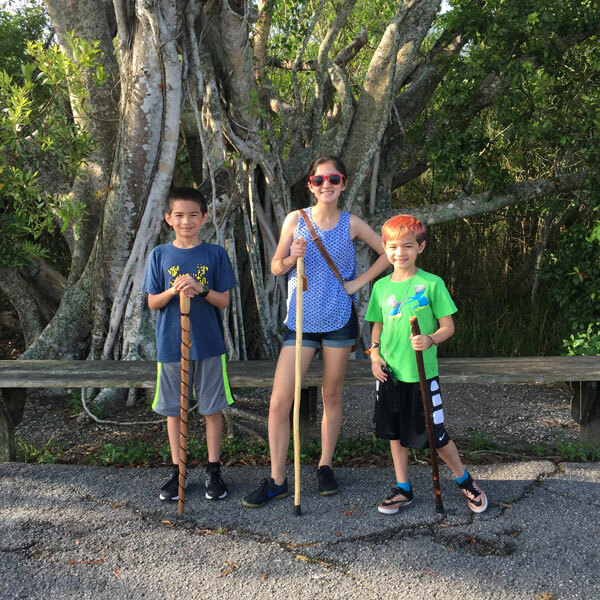 The kids brought their walking sticks with them but they were not necessary. There are lots of wildlife along the edge of the boardwalk railings. Don’t forget to look down! – This is not a looped trail. There are a number of branch offs that are worth exploring. Just because I said it was memorable does not mean it was enjoyable. One of the downsides of the Royal Palm Visitor Center which is where the Ahinga Trail starts is the infestation of vultures. We arrived for the trail at 9:00AM and saw about a half dozen vultures standing on top of some of the cars. At first we thought this was amusing. “Wow! Look at the huge bird on top of that car!” we said. By the time we pulled into our spot, however, we quickly realized this was no joke. We saw a dozen or so vultures eating the rubber on windshield wipers, rubber molding along car windows, and even on some of the tires. 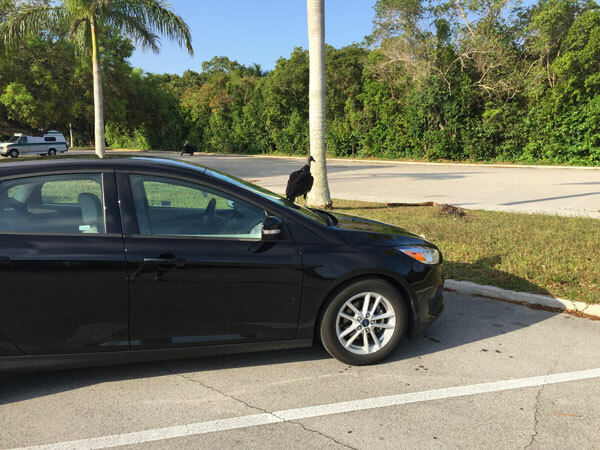 In addition, their bills and talons were scratching up the hoods of the vehicles. 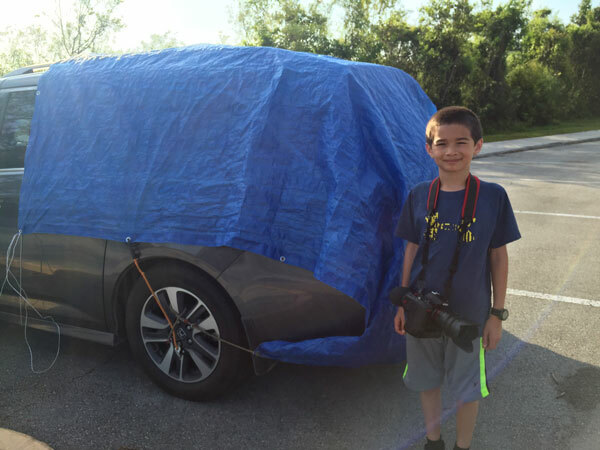 The National Park Service had blue tarps and bungee cords available at the Royal Palm Visitor Center on a first come first serve basis. They also have this webpage explaining the problem with vultures in the Royal Palm Visitor Center. Click here to view. We had our minivan so it required 3 huge tarps to cover all of the rubber and after seeing the vultures bypass the tarps on other vehicles we decided to leave and come back later in the day. When we returned at 1:00 PM, the vultures were gone. – Blue tarps and bungee cords are available for free use on a first come, first served basis. There are enough tarps for maybe 20 cars. – Vultures are a federally protected species under the Migratory Bird Treaty Act, and may not be harmed. 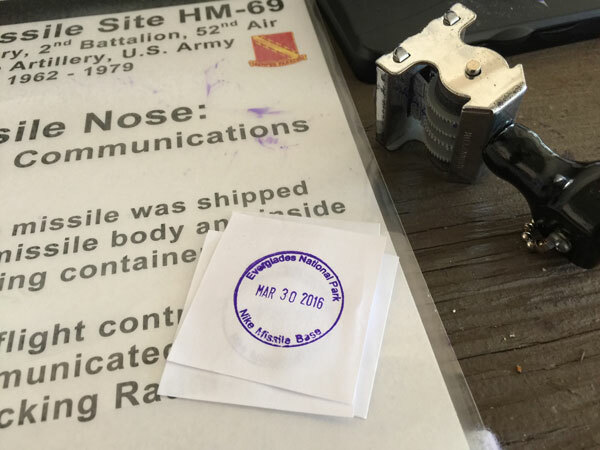 By far, my favorite part of the trip to Everglades was our tour to view the Nike Missile Site HM-69. 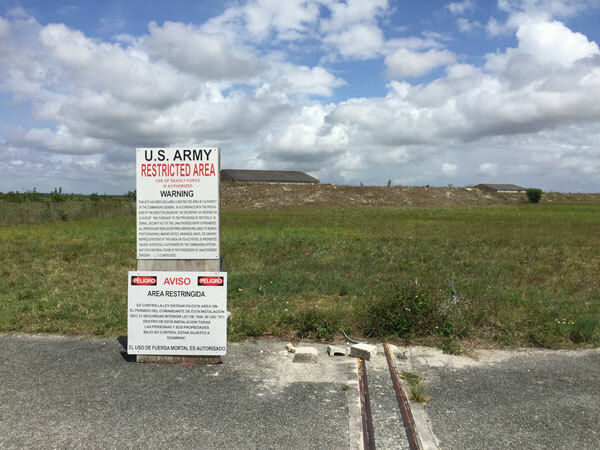 This missile site was constructed in 1964 in order to protect the United States from a potential missile strike from Cuba. 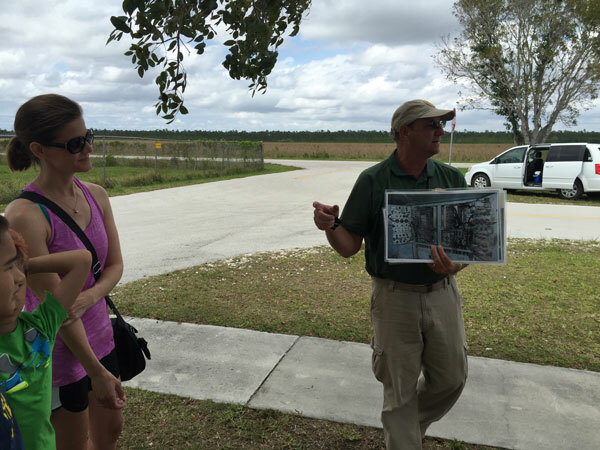 The tour starts every weekday at 2:00PM with a 40 minute orientation at the Daniel Beard Research Center which is approximately 7 miles from the Ernest Coe Visitor Center and 3 miles from the Royal Palm Visitor Center. Our tour guide was a volunteer named Scott and he was fantastic! During the orientation, he did a great job explaining the mindset of the country during the Cuban Missile Crisis. He also provided a great perspective from the soldier’s point of view offering some information from his days serving our country in the Gulf War. After the orientation, we caravanned 1 mile down the road to the missile site. There were originally 24 buildings at this complex. When the park service took it over in 1979 some of the buildings were destroyed. Now 10 buildings remains. These signs are replicas but we saw the original ones later on the tour. Scott, our tour guide assured us that despite the sign saying we would be shot if we took pictures, that we were ok! 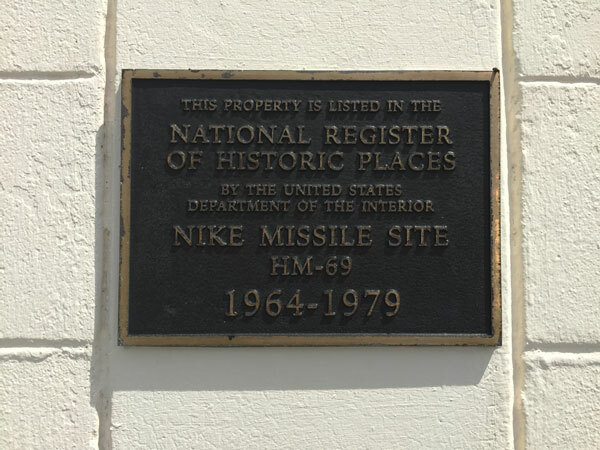 This Nike Missile Site HM-69 was designated a historic site by the National Registry of Historic Places for the role it played in American history during the Cuban Missile Crisis. Here is a video of my son (and another kid) opening the door to reveal the Nike Hercules Missile! 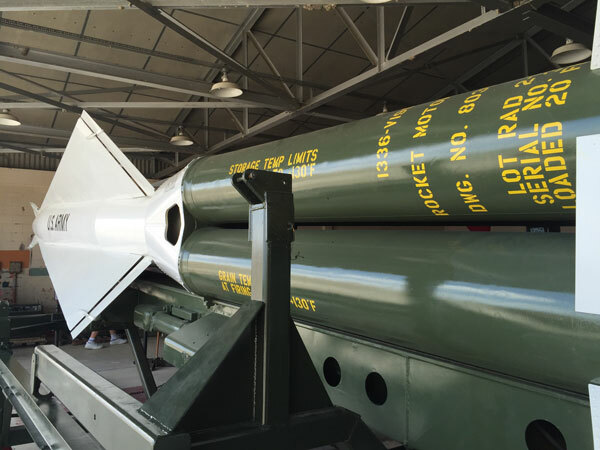 Inside the missile barn was a restored (but non-weaponized) Nike Hercules Missile which at one time housed a 40 megaton nuclear warhead. It is really neat to see such an amazing part of our history up close. And scary to think how close this country came to nuclear war in the 60’s. Inside the barn also contained artifacts from the time including these boosters. 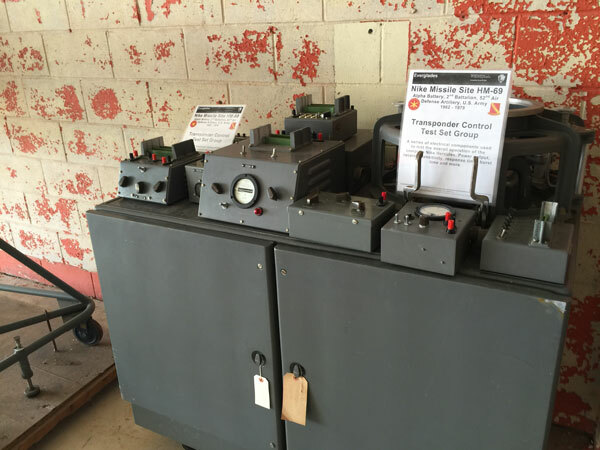 There is a Passport Cancellation station at the missile barn. We unfortunately left our passports in the car so we had to resort to stamping the paper provided. 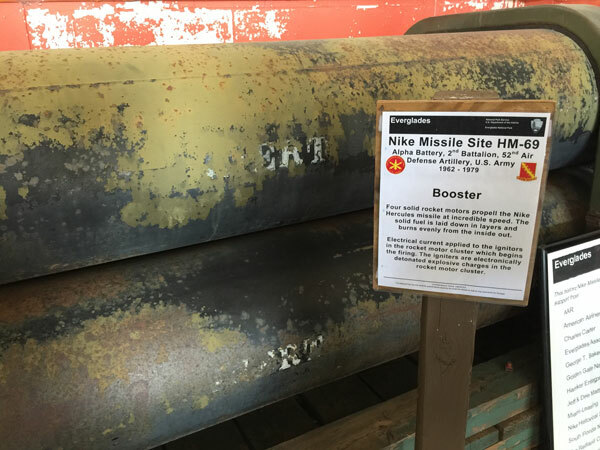 This tour of the Nike Missile Site HM-69 at Everglades National Park is truly worth a visit. While the site is sometimes open to the public without tours, I highly recommend you go on the tour. There isn’t enough written information on site to gain the full experience. – There is heavy Diamondback and Pygmy rattlesnake activity at the base. Make sure to always look where you are walking. We enjoyed our 2 day trip to Everglades National Park! Our passport stamp at the visitor centers marked our 58th National park site visited as a family. We are maintaining a good pace towards our goal of 100 parks! 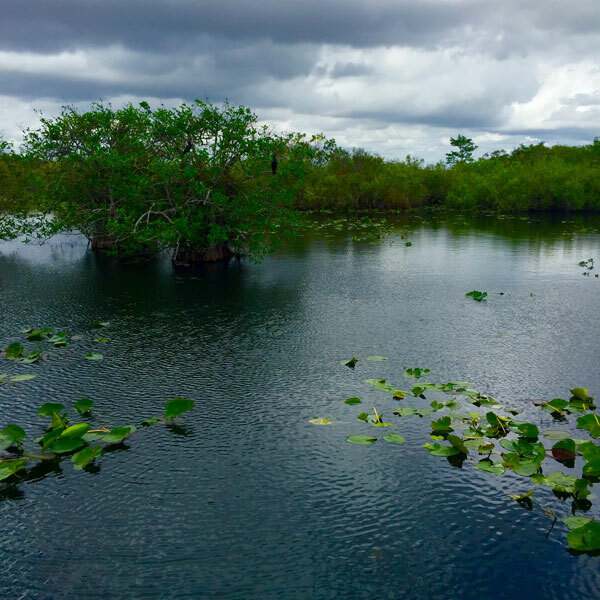 Have you been to Everglades National Park? Leave your experiences in the comments section!